In response to the Call of the National Council on Disability Affairs (NCDA) to all Duty Bearers from the government and private sectors especially in providing facilities to make the environment PWD-friendly, the House of Representatives of the Committee on Social Services recently issued a Standard Operating Procedure (SOP) No. 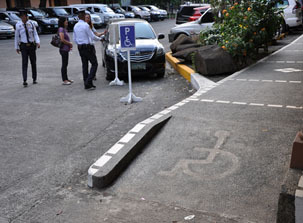 1-13 titled “Revised Guidelines on the Designation and Use of Parking Areas Inside the House of Representatives.” The SOP prescribes policies and procedures to reserve and include among others, four (4) slots of parking areas for persons with disability (PWDs) located in the North and South Wing of the House of Representatives. The House of Representatives also provides accessible ramps and railings for wheelchair users and elevators for persons with mobility problems.